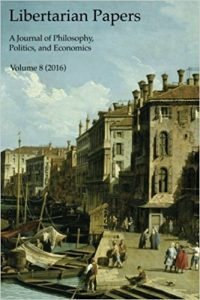 We are happy to announce that Volume 8 of Libertarian Papers (2016) is now available in a print edition. 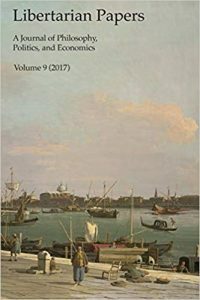 This volume contains all Libertarian Papers articles for 2016, including contributions by scholars like Jan Narveson, Billy Christmas, Peter Lewin, Ryan Murphy, Aiden P. Gregg, and many others. It also covers a wide range of the most pressing and controversial topics in modern libertarianism, including immigration, gun control, abortion, the Basic Income Guarantee, thick libertarianism, left libertarianism, childcare, the problems of private defense, and eugenics. Volume 8 is available through Amazon for $16.99. Libertarian Papers is delighted to welcome Jakub Wiśniewski to our editorial board. 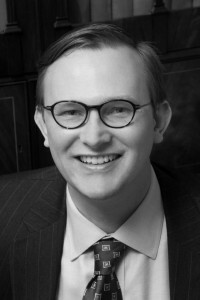 Jakub Bożydar Wiśniewski is a four-time summer fellow at the Ludwig von Mises Institute, a three-time fellow at the Institute for Humane Studies, an affiliated lecturer with the Polish-American Leadership Academy, and an affiliated lecturer and a member of the Board of Trustees of the Ludwig von Mises Institute Poland. He holds an MA in philosophy from the University of Cambridge and a PhD in political economy from King’s College London. He has published The Pith of Life: Aphorisms in Honor of Liberty, a book of liberty-themed aphorisms, and Libertarian Quandaries, a collection of essays on libertarian philosophy, as well as numerous peer-reviewed articles in philosophy, economics, and political economy in journals such as The Independent Review, Quarterly Journal of Austrian Economics, New Perspectives on Political Economy, Journal of Prices & Markets, Libertarian Papers, and Reason Papers. We are happy to announce that Libertarian Papers has been chosen for inclusion in the web archives of the Library of Congress. This means that, once archived, the complete journal will be available indefinitely both to researchers at Library facilities and by special arrangement. Of course, because Libertarian Papers uses an open-access format, the use of our content is not restricted to begin with, but we are nevertheless happy that the research we publish will be archived alongside numerous other important publications and records of note in the Library. Naturally, there is some irony in the fact that the Library of Congress wishes to preserve our content, but we take this new attention to be an indication of the increasing relevance of the research we publish. We are happy to announce that Volume 6 of Libertarian Papers is now available in a print edition. This volume contains all Libertarian Papers articles for 2014, including contributions by Arthur M. Diamond, Jonathan Newman, Stephen Cox, Jo Ann Cavallo, Shawn Ritenour, and many others. Volume 6 is available through Amazon for $16.99. 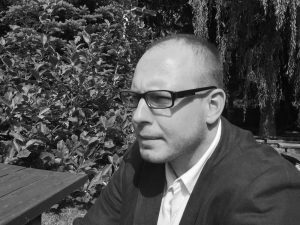 We are delighted to welcome Jason Jewell to our editorial board. Jason Jewell is Professor of Humanities and Chair of the Department of Humanities at Faulkner University in Montgomery, Alabama. He is also an Associated Scholar with the Ludwig von Mises Institute and a faculty member of Tom Woods’s Liberty Classroom, where he is currently preparing a course on the history of libertarianism. His writings have appeared in numerous publications. Most recently, he contributed an essay on the libertarian perspective to Christian Faith and Social Justice: Five Views (Bloomsbury Academic, 2014). We are happy to announce that Volume 5 of Libertarian Papers is now available in a print edition. 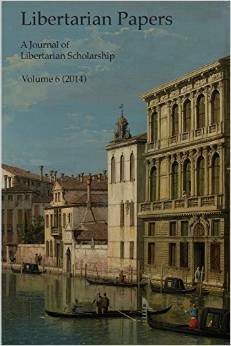 This volume contains all Libertarian Papers articles for 2013, including contributions by Walter Block, Paul Gottfreid, Stephan Kinsella, Xavier Méra, Jan Narveson, Ben O’Neill, Jakub Wisniewski, and many others. Volume 5 is available through Amazon for $16.99, or CreateSpace for $15.28, with a 10% discount. Paper and ebook versions of past volumes of Libertarian Papers are also available. 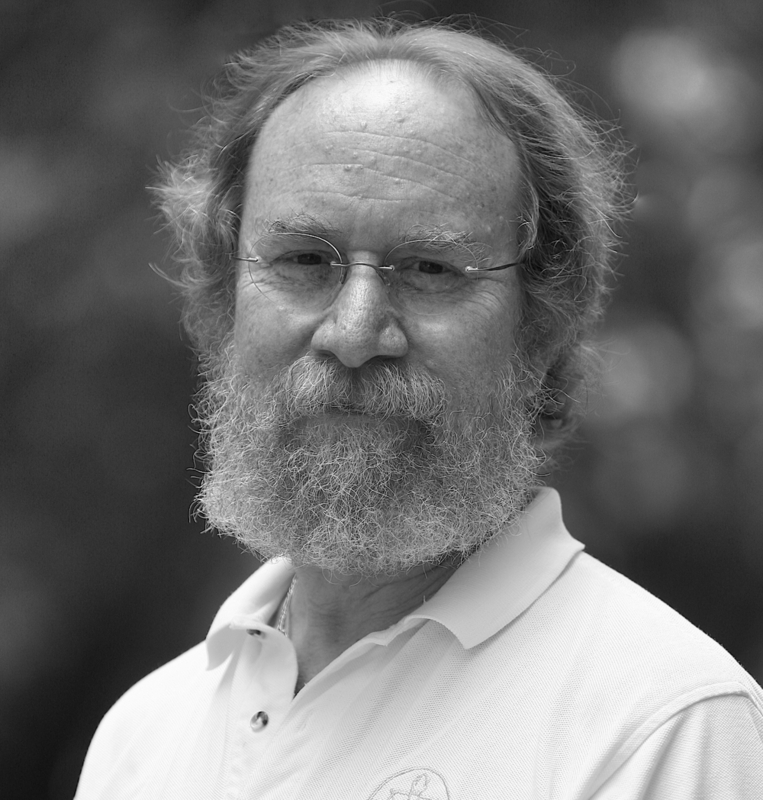 We proudly welcome Ed Younkins to the editorial board of Libertarian Papers. Edward W. Younkins is professor of accountancy and director of graduate programs in the Department of Business at Wheeling Jesuit University. He is the founder of the university’s undergraduate degree program in political and economic philosophy. He is also the founding director of the university’s Master of Business Administration (M.B.A.) and Master of Science in Accountancy (M.S.A.) programs. 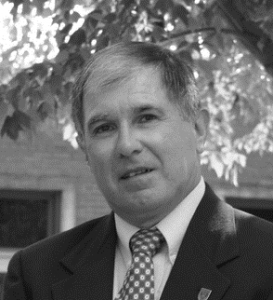 The author of numerous articles in accounting and business journals, his free-market-oriented articles and reviews have appeared in numerous publications. He is the author of Capitalism and Commerce: Conceptual Foundations of Free Enterprise (2002), Champions of a Free Society: Ideas of Capitalism’s Philosophers and Economists (2008), Flourishing and Happiness in a Free Society: Toward a Synthesis of Aristotelianism, Austrian Economics, and Ayn Rand’s Objectivism (2011), and Exploring Capitalist Fiction: Business Through Literature and Film (2014). He has also edited Philosophers of Capitalism: Menger, Mises, Rand, and Beyond (2005), and Ayn Rand’s Atlas Shrugged: A Philosophical and Literary Companion (2007). In addition to earning state and national honors for his performances on the Certified Public Accountant (CPA) and Certified Management Accountant (CMA) exams, respectively, Dr. Younkins also received the Outstanding Educator Award for 1997 from the West Virginia Society of Certified Public Accountants. We are delighted to welcome Sheldon Richman to our board of editors. Sheldon is vice president of The Future of Freedom Foundation and editor of FFF’s monthly journal, Future of Freedom. For 15 years he was editor of The Freeman, published by the Foundation for Economic Education in Irvington, New York. He is the author of FFF’s award-winning book Separating School & State: How to Liberate America’s Families; Your Money or Your Life: Why We Must Abolish the Income Tax; and Tethered Citizens: Time to Repeal the Welfare State. Calling for the abolition, not the reform, of public schooling. Separating School & State has become a landmark book in both libertarian and educational circles. In his column in the Financial Times, Michael Prowse wrote: “I recommend a subversive tract, Separating School & State by Sheldon Richman of the Cato Institute, a Washington think tank… I also think that Mr. Richman is right to fear that state education undermines personal responsibility…” Sheldon’s articles on economic policy, education, civil liberties, American history, foreign policy, and the Middle East have appeared in the Washington Post, Wall Street Journal, American Scholar, Chicago Tribune, USA Today, Washington Times, The American Conservative, Insight, Cato Policy Report, Journal of Economic Development, The Freeman, The World & I, Reason, Washington Report on Middle East Affairs, Middle East Policy, Liberty magazine, and other publications. He is also a contributor to the The Concise Encyclopedia of Economics. A former newspaper reporter and senior editor at the Cato Institute and the Institute for Humane Studies, Sheldon is a graduate of Temple University in Philadelphia. Libertarian Papers is starting the new year by unveiling our new website at libertarianpapers.org. We have kept the simple design of the old site while streamlining the user experience and improving the look and feel. We have also added some new features to improve functionality, including author tags allowing you to easily find articles from specific contributors. This is the first of many plans to enhance the reach of the journal in the coming year. We are also expanding our editorial board, starting with the addition of outstanding scholars like Anthony Gregory. More announcements are on the way in the coming months, so be sure to follow us as we continue our mission to promote high-quality, thought-provoking research in libertarian ideas. Thank you for your support, and we hope you’ll join us in our effort to advance the scholarly discourse on liberty. 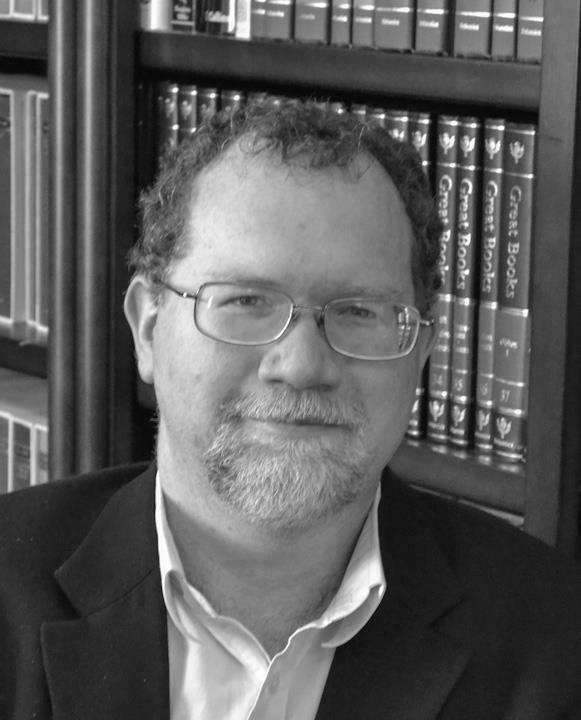 Libertarian Papers is proud to welcome Anthony Gregory to its editorial board. Anthony is a Research Fellow at the Independent Institute and the author of the Institute book The Power of Habeas Corpus in America: From the King’s Prerogative to the War on Terror (Cambridge University Press, 2013). He appears in the Institute’s Independent Watch videos and blogs regularly at The Beacon. In addition, he is a policy adviser for the Future of Freedom Foundation and a Fellow at the Center for a Stateless Society. He has written articles for The Atlantic, Washington Times, Bloomberg Business Week, Christian Science Monitor, San Diego Union Tribune, Dallas Morning News, Huffington Post, American Conservative, Human Events, Counterpunch, Antiwar.com, LewRockwell.com, Mises.org, The Freeman, Liberty, Reason.com, The Independent Review, and The Journal of Libertarian Studies. He earned his B.A. in American history at the University of California at Berkeley. We are happy to announce that Volume 4 of Libertarian Papers is now available in a print edition. This volume contains all Libertarian Papers articles for 2012, including contributions by Per Bylund, James Rolph Edwards, J.C. Lester, Nahshon Perez, Michael F. Reber, Timothy Terrell, Clarence E. Wunderlin, and many others. Volume 4 is available through Amazon for $16.99. I was informed recently that Libertarian Papers has received a quite good ranking from the Australian Research Council’s (ARC) Excellence in Research for Australia (ERA), an Australian Government body that deals with academic matters, provides systematic evaluation of a large number of scholarly journals in different disciplines and generates a database and a variety of reports ranking the journals. These ratings are often used by Australian universities to evaluate the contribution of their academics to various fields. The ERA Journal Ranking List for all law and legal studies journals is appended below. The order of the rankings is A*, A, B, C and then not ranked. Libertarian Papers is highlighted in the list. It is ranked at level A, which is the second best ranking on the list, which is considered quite good. Needless to say, we are very pleased with this recognition of the excellence the journal strives for. As part of our ongoing effort to increase the presence of libertarian scholarship in the academic community, we are pleased to announce that Libertarian Papers has been added to two new research databases. The journal is now listed in The International Directory of Philosophy, and also has a new entry in the comprehensive journal database JournalSeek. The O.P. Alford III Prize in Libertarian Scholarship is awarded annually by the Ludwig von Mises Institute. This year’s recipients are Thorsten Polleit and Jonathan Mariano, for their 2011 Libertarian Papers article, “Credit Default Swaps from the Viewpoint of Libertarian Property Rights and Contract Theory.” Congratulations to the authors! 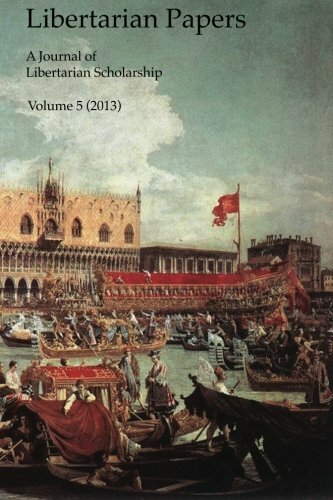 1) Although articles will continue to be published as soon as they complete the peer-review process, issue numbers and continuous page references are being added for each new volume, starting with volume 4. Consequently, the citation style for volumes 4 onward conforms to standard journal format. Information on old and new citations is available on the web pages of the different volumes, as well as those of individual articles. 2) The guidelines for manuscript submission have been updated and clarified. 3) The “About” page has been revised to include an “Aims and Scope” section. 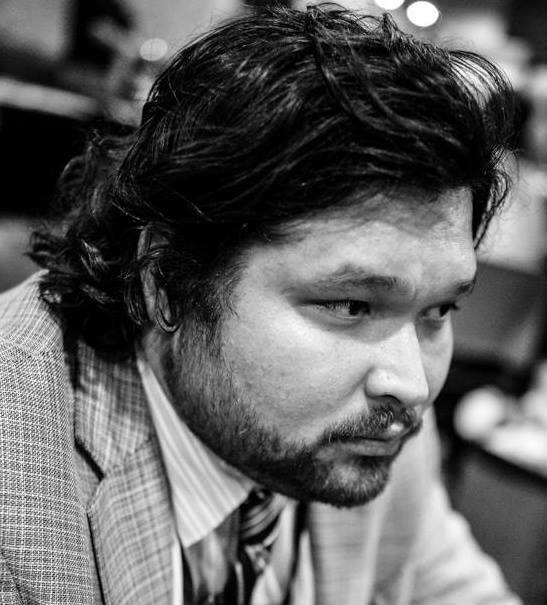 Libertarian Papers is pleased to announce that Matthew McCaffrey has agreed to serve as the journal’s Editor. A PhD candidate at the University of Angers, Mises Institute fellow, and winner of the 2010 Lawrence W. Fertig Prize in Austrian Economics, Matt previously served as the journal’s Managing Editor. He may be reached here. Stephan Kinsella will serve as Executive Editor. As discussed previously (see Libertarian Papers, Vol. 3, Part 1 Now Available in Print and Ebook), we recently decided to start offering Paper and Ebook Versions of Libertarian Papers articles, by occasionally collecting them into Parts (like issues) and offered for sale in print versions and epub versions on the major epub retailers. We did this in part in response to several requests by readers over the last couple years to prepare paper versions. So far, sales for the ebook versions on Kindle, Nook, etc., are pretty low, and, while paper sales are a bit higher, those are pretty low as well. At present the cost to prepare the epub and Createspace files, plus the ebook-aggregator service (Bookbaby) and Createspace fees is probably too high to be recouped by sales. I’d like to gauge reader interest in both the ebook, and paper, versions, to determine how to proceed going forward (although the sales are already telling me something). What we will probably do, going forward, at least for now, is publish paper versions only, since the majority of the cost per issue lies in the epub preparation fees and the Bookbaby fees. The costs for preparing the Createspace file and its fees are much lower, and might make this sustainable going forward. If you have any thoughts or suggestions, feel free to leave a comment or email me.